Mount Holly Township first turned to TBC to handle strategic communications surrounding the announcement of the settlement agreement between Mount Holly Township and Mount Holly Gardens Citizens in Action, marking the end of a 10-year legal struggle. Our team met with attorneys, elected officials and key decision makers representing both sides of the matter; developed a media advisory, press release and fact sheet; and orchestrated simultaneous distribution of all materials to members of the media nationwide once the decision was announced in real-time. We worked with media outlets throughout the country that were following this story on pre- and post-settlement placement opportunities. The results included local, regional and national coverage by The Philadelphia Inquirer, ABC News, ABC News, Bloomberg Businessweek, Reuters, PolitickerNJ, The Wall Street Journal, Bloomberg News, The New York Times, the Star-Ledger, USA Today and the SCOTUS blog, , among others. In addition to providing communications and media relations support surrounding the settlement, we wrote and submitted a 950-word article to the League of Municipalities magazine on the litigation and its resolution, which was published in the March 2014 issue. Our work with the Township has evolved since the settlement. For a few years prior to being hired full-time, we were frequently called upon to assist with events that required media relations throughout Mount Holly. These include the Annual Holiday Parade and Tree Lighting, and ribbon cutting ceremonies to commemorate the reopening of Mill Dam Park and the opening of Mi-Place at West Rancocas, marking the completion of the first phase of the greater West Rancocas Redevelopment Project. In 2015, we were hired by Mount Holly as communication consultants to assist with significant issues relating to the economic revitalization of the Township. As part of a strategic positioning plan, we worked closely with the Mayor, Township officials, the Mount Holly Police Department and representatives from various local organizations and businesses to develop and execute various communications efforts to better inform the public about developments, events and newsworthy Township matters. We launched the Township’s first newsletter, Rancocas Valley News, and were called upon to help maintain and populate the Township’s website and social media pages with relevant information about upcoming community events and town news. 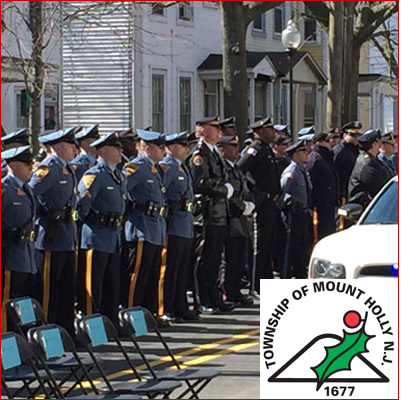 In addition, our team successfully secured extensive media coverage for a variety of special events in and around the Township, including but not limited to: Park Improvements and Grant Funding (Mill Dam park and Buttonwood Lake Dam); the 40th anniversary of a memorial march recognizing the lives of three fallen Mount Holly police officers; the unveiling of the first redeveloped homes in the Mount Holly Gardens neighborhood; Memorial Service for former Mount Holly Police Officer/State Trooper Sean Cullen; Spellbound Brewery’s Century Bicycle Ride; Hollystock Music Festival; special Superhero-themed event for a local 7-year-old boy recovering from a brain tumor, which went viral online & gained national media attention (Good Morning America); and various community events (St. Patrick’s Day Parade, Independence Day Fireworks, Annual Holiday Tree Lighting Ceremony, Veterans Day Memorial).